Bus Suggestions wrote: Question: Can anyone tell me what route the 1979-1983 LincLine buses took? This is purely on memory. Terminus in Bennett St East Perth. Left Wittenoom St, Left Hill St, Right Wellington St, Roberts Rd, Railway Rd, Left Loch St, Right Stirling Hwy, Right Queen Victoria Street, Right Parry Street, Left Cantonment Street to terminate near Queen Street. Return was Queen Street, Left Adelaide Street, Queen Victoria Street, Left Stirling Hwy, Left Loch Street, Right Railway Rd, Continue straight Roberts Rd, Continue straight Wellington Street, left Bennett Street. Roberts Rd and Hay Street were both bi directional back in the day. Route 72 to Cottesloe back then picked up the slack of servicing Swanbourne and Grant Street Stations by travelling Stirling Hwy, Stirling Rd, Curtin Ave, Eric St. Once Burke reopened the Freo Line, Route 72 was realigned to service the full length of Eric St between Marine Pde and Stirling Hwy. The provisions at Canning Bridge Station are barely adequate for two rigid buses at it stands. With 100 and 101 services sometimes departing concurrently, or multiple terminating services utilising the u-turn sequence of the lights, it just wouldn't be practicable, unless the traffic light's sensors and programming were altered to better-prioritise buses. As it stands, the bus u-turn and westbound sequences only occur once in the light cycle. Buses get about 5 seconds in that sequence (it should be variable). With several buses waiting to utilise the u-turn, you would likely cause chaos holding up westbound buses. My understanding of 960s rarely (if ever) having articulated buses allocated is due to insufficient layover space at Curtin University & ECU Mt. Lawley, in fact, ECU Mt Lawley mightn't even be artic-friendly. ok thx i forgot also the sharp u turn intersection at canning. btw before i thought it is because too small station and only has 1 line but how come other route like 114, 115, 160, 910 can use artic and these route is not as busy as 100/101 in peak uni (except 910). Due to stand arrangements at Perth Busport, 960's are not permitted to have articulated vehicles running them, as there is the possibility of them not being able to get onto the allocated stand in certain conditions. This is factored in to the shift cuts, to ensure that 960's are only on shifts that have rigid buses assigned to them. Very seldomly, an artic may appear on one, if a bus is changed off on road by an artic. Mr. 1809 covered the bit I forgot about. In which case it also points to poor programming of the DSMS (Dynamic Stand Management System) at Perth Busport. pasha241 wrote: btw before i thought it is because too small station and only has 1 line but how come other route like 114, 115, 160, 910 can use artic and these route is not as busy as 100/101 in peak uni (except 910). All other routes you city definitely get busy at times throughout the day, and naturally we're talking several routes servicing a part (or all) of Canning Hwy as opposed to the 100 and 101 being the exclusive means of accessing Curtin from Canning Bridge. Also note there is no issue with westbound services utilising articulated buses as Canning Bridge is not a timed stop, nor do services terminate there to commence other runs. It is only a compulsory stop. Bear in mind some of the other services you mention don't always terminate at Curtin University. As for turnaround times, if your trip to Curtin runs late for whatever reason, the turnaround time can help to alleviate the inadequate slack in the timetable. Eliminating it would not only increase the possibility of late running, it would increase stress on drivers who are faced with even later running if they need to secure their bus to use the toilet (for example). I have a query. I have seen a few Mercedes Benz OC500LE CNG (Ex-CAT) and Diesel (ex-Transperth) as well as new Volvo Buses that do not contain rear windows. I was wondering why the back of the bus had no rear windows. 2. There are two transmission variants for the Mercedes OC500LE (TransRegional) - ZF Ecomat and Ecolife. Why Transperth decided to have both the Ecomat and the Ecolife transmissions since their delivery back in late 2010? What sort of Emission standards do they meet? Euro 4, 5 or 6? Shoudy Chen wrote: There are two transmission variants for the Mercedes OC500LE (TransRegional) - ZF Ecomat and Ecolife. Why Transperth decided to have both the Ecomat and the Ecolife transmissions since their delivery back in late 2010? What sort of Emission standards do they meet? Euro 4, 5 or 6? My understanding was the Ecomat transmission was superseded by the Ecolife around this time. These OCs are diesel, and will be Euro III or Euro V dependent on age (VIN number will be the giveaway; Euro V has a chassis number starting with WEB6344202 and Euro III starts with WEB6342202). Gas OCs are Euro IV. I was thinking Shoudy Chen was talking about the ex-Transperth OC Diesels... if so, they're both Euro 5. The gearboxes, I'm gonna hazard a guess at some of the OC's were built with one of the last batches of Ecomat's, while the rest were given Ecolife's. End of 2010 was the transition from Ecomat to EcoLife on the OC 500 LE/RF chassis production. Operators did not get a choice. Does anyone know who is the operator of this Express-bodied Volvo B7R, registered as 1DRZ185? Looked up on Perthbus.info and it only shows 1DRZ662. Zidanehartono asked - Does anyone know the operator of this Express-bodied Volvo B7R, registered as 1DRZ185? Swan Valley Explorer, operated by Adams Coachlines. Uses four (4) ex Transperth (PTA) O405NH low floor units. I have seen B93 [1GQP110] which is ex TP1519. On perthbus, B89 [1GQI496] shows up as ex TP1510. Any idea what the other two are ? 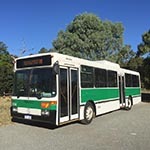 panther998 wrote: Swan Valley Explorer, operated by Adams Coachlines. B90 = Ex 1718, B91 = Ex 1717. Just noticed the buses are using the digital bell sound as the bus stop button had been pressed instead the two second buzzer sound in the Volvo buses. Anyone knows when they’ve changed these over?? It's been sometime since last year. shinjiman wrote: Just noticed the buses are using the digital bell sound as the bus stop button had been pressed instead the two second buzzer sound in the Volvo buses. Anyone knows when they’ve changed these over?? They started changing them at the end of October last year, only on the Optimus buses (the CR228L Volvos are keeping the old buzzer). By now almost every one has been changed over, but there are a few stragglers that haven't been changed yet, such as 3089 which I was on a couple weeks back and still had the old buzzer.